The Rev. Thomas Robert Malthus FRS (13 February 1766 – 23 December 1834), was a British writer on political economy and population. 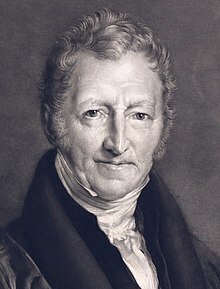 Malthus popularised the economic theory of rent, and was the first to use the phrase struggle for existence. Malthus is famous for his theories about population: its increase or decrease in response to various factors. 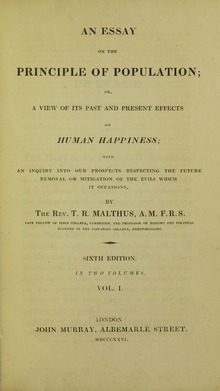 There were six editions of his An Essay on the Principle of Population, published from 1798 to 1826. He said that sooner or later population gets checked, by famine, disease, and widespread mortality. 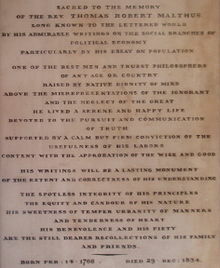 He wrote in opposition to many who saw society as improving, and (in principle) as perfectible.viii William Godwin and the Marquis de Condorcet, for example, believed in the possibility of almost limitless improvement of society. So, in a more complex way, did Jean-Jacques Rousseau, whose notions centered on the goodness of man and the liberty of citizens bound only by the social contract. Malthus placed the longer-term stability of the economy above short-term expediency. He criticised the Poor Laws,p39-45 and (alone among important contemporary economists) supported the Corn Laws, which introduced a system of taxes on British imports of wheat.pxx He thought these measures would encourage domestic production, and so promote long-term benefits. Malthus became hugely influential, and controversial, in economic, political, social and scientific thought. Many evolutionary biologists read him, especially Charles Darwin and Alfred Russel Wallace. For both of them, Malthusianism became a stepping-stone to the idea of natural selection. Malthus is still a writer of great significance and controversy. ↑ Several sources give Malthus's date of death as 29 December 1834. See Meyers Konversationslexikon (Leipzig, 4th edition, 1885-1892), "Biography" by Nigel Malthus. But the 1911 Britannica gives 23 December 1834. ↑ Shorter Oxford English Dictiionary. ↑ 5.0 5.1 Geoffrey Gilbert, Introduction to Malthus T.R. 1798. An essay on the principle of population. Oxford World's Classics reprint. ↑ 6.0 6.1 6.2 Malthus T.R. 1798. An essay on the principle of population. Oxford World's Classics reprint. ↑ Malthus T.R. 1826. An essay on the principle of population. 6th ed, Book 3, Chapter 6. This page was last changed on 16 October 2018, at 11:44.